For a variety of reasons, including my lingering cold/flu these past few weeks, we’ve been woefully behind in preparing for the holidays. Tonight, Cam and I decided to stay home from Tae Kwon Do and finally attend to our holiday decorations. I brought our small artificial tree up from the basement and the box of ornaments. It was slightly disappointing that we didn’t keep tradition and cut our own tree this year, but Cam and I decided to make the best of our situation with our “Charlie Brown” tree. We decided to choose only our favorite ornaments because the tree is so small. When I came across this one, I knew that it had to be among the chosen few. I was about 8 or 9 when I received this ornament, tied to a Christmas present. I was taking lessons on an Appaloosa pony at the time, and I remember taking a felt marker and coloring spots on the flanks of the ornament, just like the pony I loved at the time. Over the years, the spots have faded and now resemble dirt. But I recall how this ornament meant the world to me that year. Each Christmas I prayed for a pony or horse of my own, and at the time receiving horse models, stuffed horses and ornaments was as close as I would get to the real thing. But each year I asked Santa Claus for a horse anyway. A few years later, my dream came true, but I never forgot the many horses who kept my faith going, such as this small circus horse. Each Christmas from then on to 35 years later, this old ornament has represented the horse of my dreams. 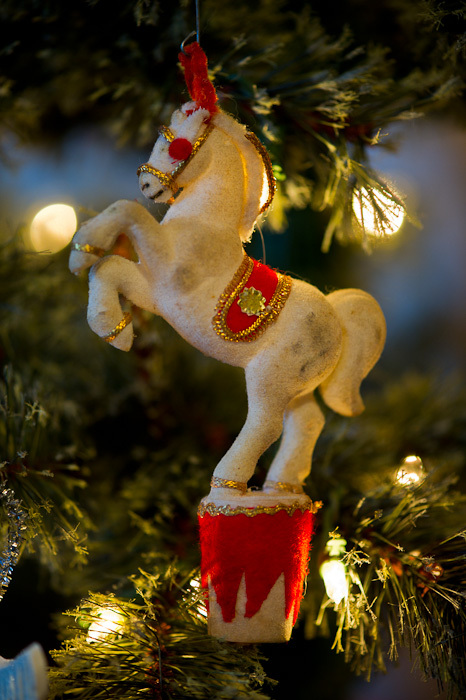 Some years I’m fortunate to have a horse in my life at Christmastime and others I’m not, but placing this white circus horse carefully on my Christmas tree reminds me of the spirit of Christmas and the dreams that this time of year brings to those who believe. And I will always believe.